ORONO, Maine — The University of Maine got off to a sluggish start in Friday’s Hockey East game against visiting UMass Lowell and found itself staring at a 2-0 deficit 26 seconds into the second period and being outshot 15-5. But the Black Bears came storming back with four unanswered second-period goals — including three in a span of 3 minutes, 29 seconds — to earn a 4-3 victory at Alfond Arena on Friday night. UMaine (3-3-1, 1-1-1 HE) before Patrick Shea and Tim Doherty added power-play goals. “We didn’t play the way we’re capable of in the first period but it was a really good answer by us in the second and played a good 40 minutes,” said junior center Doherty. Chase Blackmun scored a first-period goal for UMass Lowell (3-4, 0-2 HE) and Sam Knoblauch made it 2-0 only 26 seconds into the second period. Lucas Condotta pulled UMass Lowell within 4-3 with 2:26 left in the third period but the Black Bears hung on for the win. The Black Bears special teams played a huge role in the victory as the struggling power play, operating at a 9.1 success rate entering the game, went 2-for-4 and the Black Bears killed off all four UMass Lowell power plays, including a five-minute major in the third period. The teams play again Saturday night at 7:30. Jeremy Swayman made 27 saves for UMaine and Tyler Wall had 23 for UML. “It was a nice win. It was a great pushback after being down 2-0,” said UMaine head coach Red Gendron. “We competed real hard. The second period was excellent for us. We executed on the power play and the penalty-killing was terrific all night. Pearson began the comeback at the 1:13 mark of the second period, just 47 seconds after Knoblauch had made it 2-0. Eduards Tralmaks broke down the right wing in a 2-on-1 with Pearson and held the puck cleverly until Pearson was in position at the far post. He then slid it over and Pearson simply had to swat the puck into the empty net. “That line (Pearson between Tralmaks and Jacob Schmidt-Svejstrup) got the goal and that got all the lines going,” said freshman right wing Adam Dawe, who had two assists. Tralmaks and Pearson teamed up again 3:49 later just after Pearson was hauled down by Mattias Goransson on a partial breakaway. Tralmaks trailed the puck to the left corner and found Pearson alone in the middle of the slot. Pearson one-timed the puck past Wall’s glove hand. “Those were two great passes. I had an open net on the first one and I was open in the slot on the second one and he put the puck right on my stick,” said Pearson. 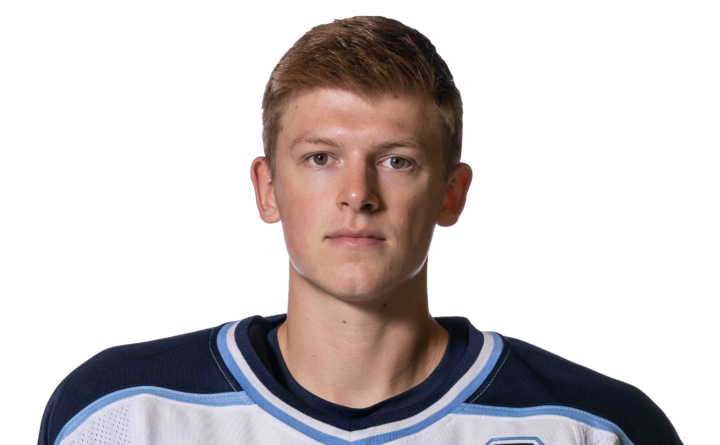 Goransson received a hooking penalty on the play and the Black Bears converted when Doherty put a precise pass from the left-wing boards onto the stick of the darting Shea, who tipped it into the short-side corner. “I saw (Shea) going to the net. He’s a fast player so I put it into an area and he did a good job putting it home,” said Doherty. Doherty made it 4-2 at the 13:34 mark when he slammed home a rebound after Brady Keeper stickhandled from the point into a shooting lane and fired a low snap shot that was kicked out by Wall. The puck landed on Doherty’s stick and he swept it home. The River Hawks had a decided edge in play in the first period and could have had more than a one-goal lead but Swayman came up with some important stops to keep the Black Bears within one. Blackmun opened the scoring with a slap shot from just inside the blue line off a Knoblauch drop pass. Knoblauch extended the lead 26 seconds into the second period when Connor Sodergren and Charlie Levesque set him up off a UMaine turnover at the defensive blue line. Knoblauch pushed a one-timer through Swayman’s legs. Danny Perez was assessed a hitting-from-behind major at the 7:51 mark of the third period but the Black Bears did an exemplary job swarming the puck, getting clearances and and keeping the River Hawks on the perimeter. Condotta scored with a nifty individual move as he circled a UMaine defenseman as he broke down the left wing and then cut across top of the crease before sliding the puck through Swayman. Colin O’Neill had a glorious chance to tie it with the extra attacker but he missed an open net with a one-timer from the middle of the slot.